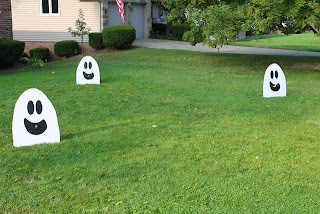 In Mid-September my boys and I gave our Three Ghost Friends lawn ornaments a fresh paint job. 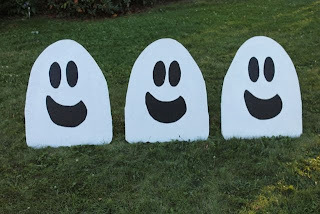 At the time, I was looking forward to October to see if I could to act out a few scenes from my books in the front yard. 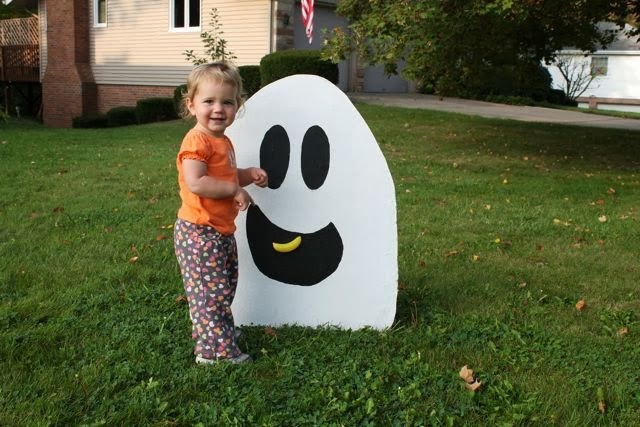 Early in October, my daughter fed each ghost a piece of fruit just like in Three Ghost Friends: Learn About Colors. I am so happy I included her in this activity instead of doing this all on my own. 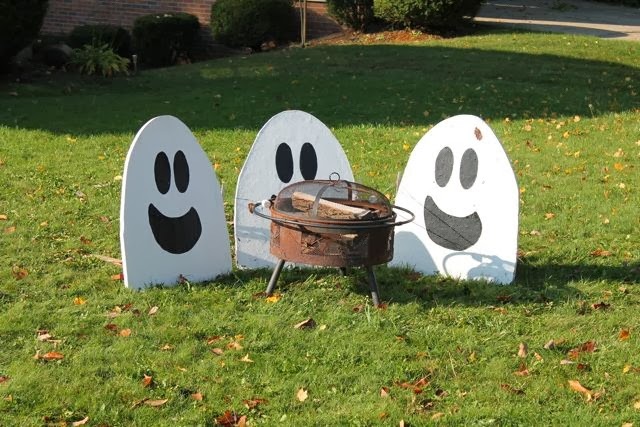 She was so excited about what the ghosts were doing all month long. I played out the scene over the course of many days. First, the ghosts ate the fruit. Then, the next day they changed colors and of course they had to dance and dance for a few days. 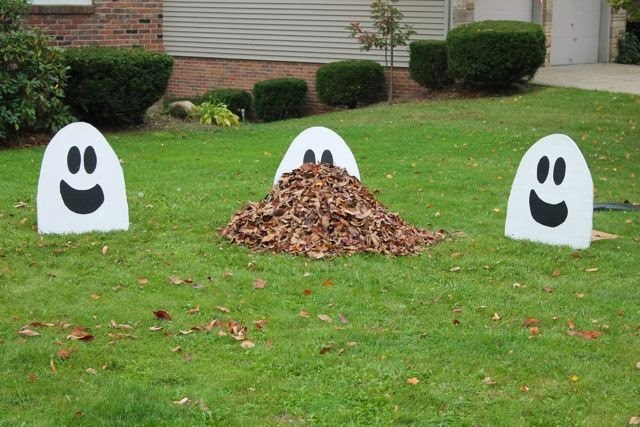 Eventually, the Three Ghost Friends needed to rest. 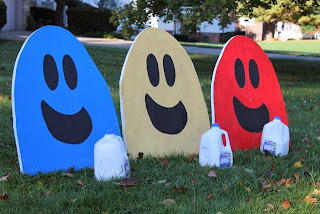 Then, I poured white paint into these milk jugs to sloshed it around to allow the ghosts to see the milk. The next day the ghosts were back to white after drinking the milk. A leaf pile isn't in any of my books, but it does show that the Three Ghost Friends are always having fun together -- just like in the books. They even roasted marshmallows for a few days. It should be noted that my daughter ate one of the marshmallows right off the stick one day when I wasn't paying attention! 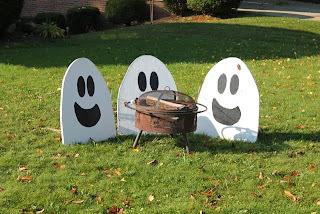 Marshmallow roasting shows up in two of my books Three Ghost Friends: Learn About Opposites and Three Ghost Friends: Learn About Shapes. The Three Ghost Friends even played with the pumpkins that my children got at the pumpkin patch. I have a FREE printable book where the Three Ghost Friends count pumpkins in their neighborhood. Today, I dressed up the ghosts in Halloween costumes! 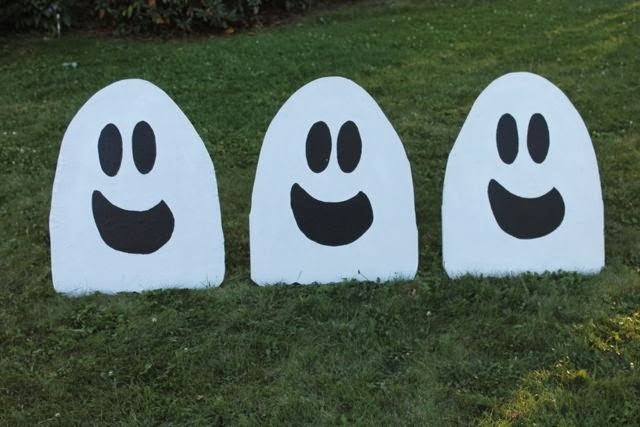 In Three Ghost Friends: Learn About the ABCs - Halloween Edition the Three Ghost Friends try on costumes from A to Z! 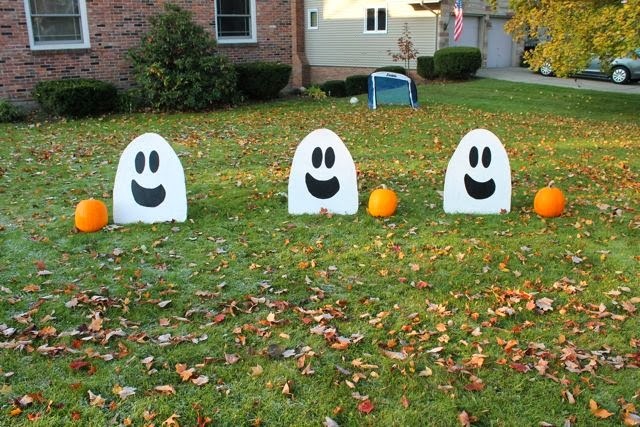 A funny side note is that I did all these funny things with the ghosts when my three-year-old son was at preschool. Every day or two, he would come home to something new. He was convinced that the ghosts were alive and were doing all these silly things. My oldest daughter would tell him that "Dad, does it" but he told her very clearly that the ghosts do it while he is at school. So funny! I love three-year-olds! Also, my wife recently shared my books with members of our neighborhood via our neighborhood Facebook page. She talked about the backstory as to why we have 3 giant ghosts in our front yard, and told them about my books. 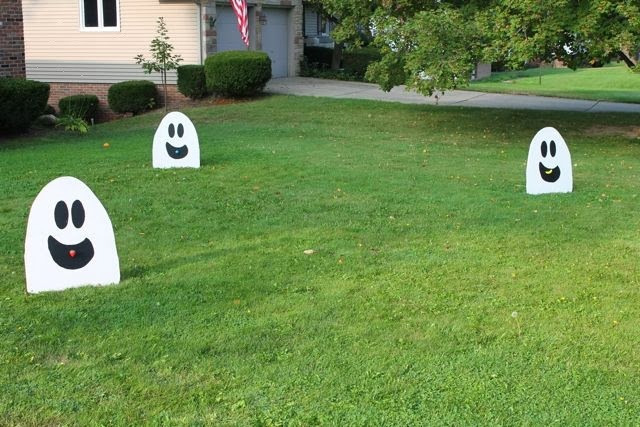 More than one person commented that they thought the ghosts were initially moving around the yard as a prank, and not by us. 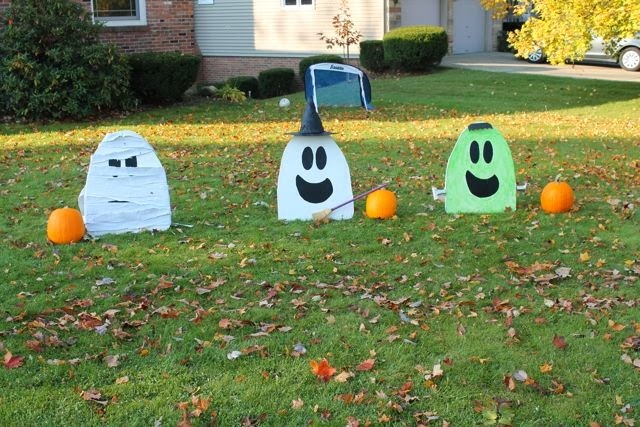 Also, one neighborhood member said she looked forward to driving by each night on her way home from work to find out what the ghosts were up to that day!